McLaren Automotive recently unveiled their first ever GT offering, the Speedtail. If the images have got you excited, you should know that this back from the future looking automobile will be made in limited numbers. 106 to be precise. And all of them have been reserved. The prices of the McLaren Speedtail start from £1.75million plus taxes (approximately Rs 16.48 crore, excluding the tax and duties). While McLaren states that the Speedtail is a more of a tribute to the legendary F1, one must know that is the most powerful and aerodynamic drag efficient car that McLaren has ever produced, helping it exceed the 391kmph max speed of the latter. The British automobile manufacturer mentions that the Speedtail is capable of reaching a maximum speed of 403kmph and has an acceleration of 0-300kmph in 12.8 seconds. However, it's not the fastest to do so. The Porsche 919 Hybrid (Mk II) can touch 300kmph in 8.4s. The deliveries of the McLaren Speedtail will start by 2020. "McLaren has never built a vehicle like the Speedtail before. As our first Hyper-GT, the Speedtail is the ultimate McLaren road car; a fusion of art and science that combines an astonishing maximum speed with an iconic central-driving position and a truly pioneering approach to bespoke personalisation. 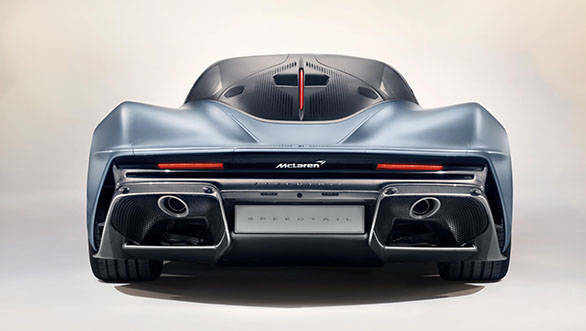 A ground-breaking hybrid powertrain sits within a lightweight carbon fibre body reminiscent of sleek streamliners that once set world speed records, while the luxurious three-seat cockpit offers a sublime combination of an incredible driving experience, unmatched individualism and innovative materials never seen before in a road-going vehicle," mentioned Mike Flewitt, Chief Executive Officer, McLaren Automotive. What makes the McLaren Speedtail important is the fact that it is the first of 18 new cars or derivatives that McLaren will introduce as part of its Track25 business plan that will increase the number of models, introduce new platforms and also increase the presence of the brand in new countries. India is being said to be one of them. The McLaren Speedtail model is built around a bespoke McLaren Monocage carbon fibre structure. This has helped in offering a lightweight construction with the extensive use of carbon fibre in the body. Additionally, this limited edition McLaren also comes with aluminium active suspension and carbon ceramic brakes. 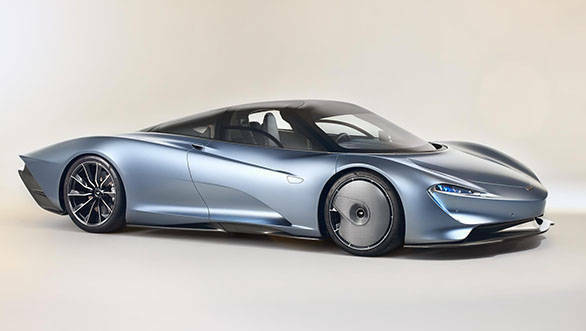 The powertrain in the McLaren Speedtail will be a petrol-electric hybrid that produces a combined output of 1,050PS. The Speedtail weighs only 1,430kg dry that helps offer a better straight-line acceleration for a McLaren, with 0-300kmph in just 12.8 seconds. The McLaren P1, previous Ultimate Series hybrid, could reach this speed in 16.5 seconds. Pirelli and McLaren have made a bespoke P-Zero tyre for the Speedtail's extreme speed. The driver is positioned centrally in the futuristic looking cockpit, with seating for two additional passengers set slightly rearwards. There is luggage space within both the nose and tail of the vehicle and a bespoke luggage set available as an option. The carbon fibre, leather and metalwork on the cases have been made to match the interior specification of their Speedtail. The static wheel covers work in conjunction with multiple ducts and air paths to reduce turbulent air within the wheelarches. As air passes out of the low temperature radiators for instance, it is vented into the front wheel arches. This paired with heat energy generated by the lightweight, carbon ceramic braking system  the air is channelled through the ducts in the fixed front wheel aero cover in a consistent flow pattern. Pressure within the wheelarches is also reduced via the lower door vents, which draw the turbulent air created by the rotating front wheels out of the arches and drive it smoothly along the sides of the McLaren Speedtail. The company states that instead of conventional door mirrors, there are two discreet, high-definition digital cameras that glide out of the doors when the vehicle ignition is activated. Traditional fixed door mirrors create a surprising amount of air turbulence, but with a significantly smaller profile, the cameras on the Speedtail have only a minimal effect on airflow. The camera feed is displayed on two screens positioned on either side of the instrument panel in front of the driver.